For both females and males, the new data suggests important opportunities for leveraging strengths to become more effective at people leadership. Emotional intelligence (or EQ) means being smarter with feelings — accurately appraising emotional data, and using that data to optimize decisions. A growing body of evidence shows these capabilities are tied to improved leadership, effectiveness, relationships, decision-making, health, and wellbeing; which helps higher EQ leaders create greater economic and societal value (see www.6seconds.org/case). While women and men alike have challenges in accurately identifying, managing, and applying the data and energy contained in emotions, a common perception is that women are more “tuned in” when it comes to feelings. Numerous studies show that “Ms. Average” will have a slightly higher EQ score that “Mr. Average.” A new analysis confirms this result, but presents three key new findings that are essential for understanding these gender variations. Awareness is “Know Yourself” – accurately assessing emotional data. 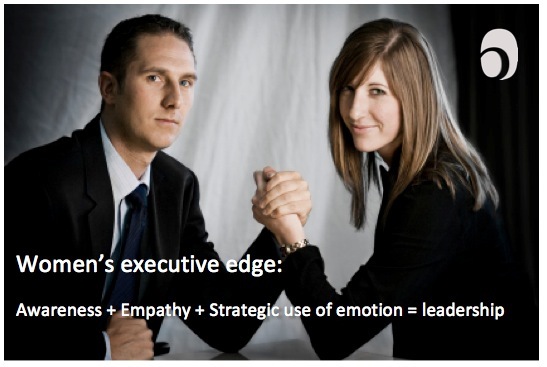 Management is “Choose Yourself” – consciously selecting emotional response. Direction is “Give Yourself” – purposefully applying emotion toward significance. In these three dimensions, analysis of 24,436 people from around the globe shows women have a slight edge in all three. 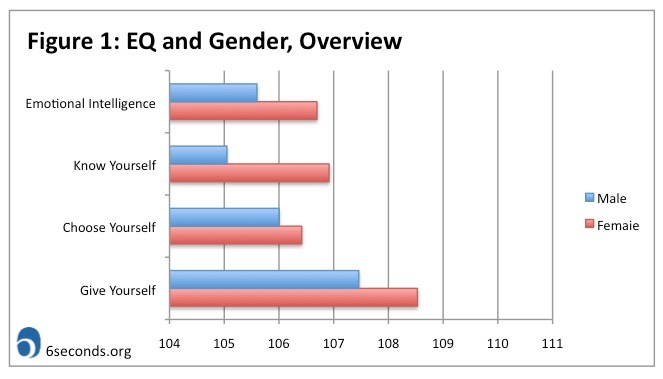 In the Know Yourself area, Ms. Average scores 1.8% higher than Mr. Average – but only 0.4% higher in the Choose Yourself area (see Figure 1: EQ and Gender, Overview). The implication is that women tend to be slightly more self-aware will not be a surprise. It’s important to note that these scores are normative, approximately distributed on a bell curve, which means that among the 12,236 women in this sample, roughly 7,300 will be near the middle. Some 1,800 will be much higher on EQ, and approximately the same number will be much lower. The same is true for the 12,200 males in this group. This means that any given female is not necessarily higher on EQ than her male counterpart, but on average, women are stronger in this domain. Within the three component parts of the Six Seconds Model are eight specific, learnable, measurable competencies. 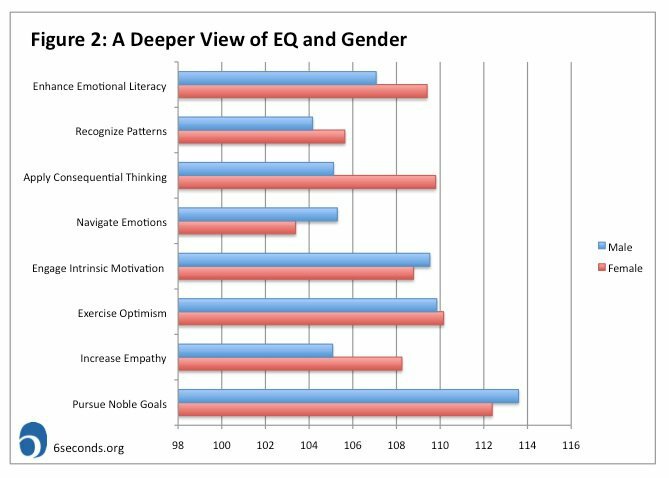 Looking at this more detailed view, it becomes apparent that women have a stronger EQ capability in certain areas of emotional intelligence – where men (on average) have more strength in other components. “Enhance Emotional Literacy” means identifying and understanding feelings. “Recognize Patterns” means acknowledging frequently recurring reactions. On the other hand, men have an advantage in “Navigate Emotions,” which enables people to harness the insight and energy of feelings to move forward intentionally: Responding rather than reacting. This is also the lowest-scoring area for women in the sample, suggesting that more often females will find their emotions in charge rather than proactively and mindfully working with emotion. That said, because of the female edge in “Enhance Emotional Literacy” and “Apply Consequential Thinking,” it’s likely that “Ms. Average” will have the capability to understand and evaluate emotions better that “Mr. Average.” So if she applies these strengths (rather than trying to just push emotions away), females could more quickly move toward mastery. “Increase Empathy” is another area where females are scoring higher – which aligns with typical societal expectations of female nurture. In the workplace, this translates to an important competitive advantage in the ability to influence and engage others. But, higher empathy paired with lower navigation can lead to emotional overwhelm. Within the global sample, 6,236 respondents are in a senior leadership role (40% of these are female). Because emotional intelligence is correlated with career success, we know that people in higher-level roles will generally have higher EQ – and this is confirmed in this dataset. In terms of overall EQ, the gender gap widens from 1% to nearly 2% with female leaders pulling further ahead. Looking at individual competencies, the mix of gender gap changes in important ways. For example, one of the areas that appears to be most powerfully linked to career progress is “Pursue Noble Goals,” the capability to put purpose into action. In Figure 2, above, males have a slight edge in this competency, but in Table 1 we can see that for those in leadership positions, there’s essentially no gender difference. 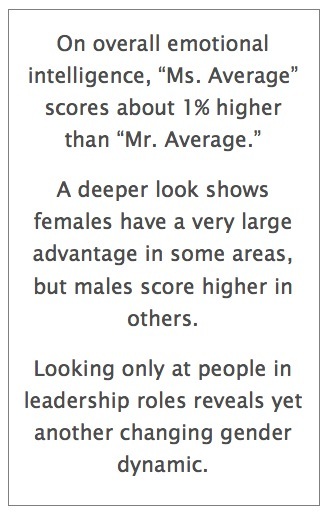 Figure 3, below, shows the scores of females and males in leadership roles. It can be compared with Figure 2. 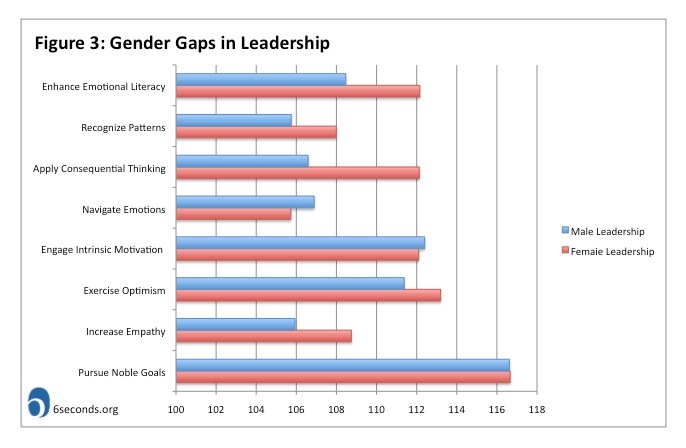 In “Enhance Emotional Literacy” and “Apply Consequential Thinking” the gap widens among leaders, suggesting that female leaders are especially insightful in the emotional domain and even more careful in their responses (compared with the general population). The dynamics are also shifting in “Exercise Optimism,” a competency that facilitates a proactive, solution-oriented approach. Among the general population, females are not significantly ahead of males. Among leaders, however, the gap widens as the average female scores over 1.6% higher. As is shown in Figure 3, this becomes the 2nd highest competency among female leaders, providing a resource for solving problems and generating energy. Between job levels, the only area where males are starting to close the gap is “Increase Empathy.” In the general population, males score over 3% lower than females, but among leaders it’s only a 2.6% difference (but females in leadership are still considerably higher in this area). This is also one of the lowest-scoring areas for male leaders, suggesting an important opportunity for the relatively few empathic male leaders to stand out. This analysis provides important insight into the opportunities for females in the workforce, and for those concerned with developing organizational leadership. First: Women who want to advance their careers need to tap into the capabilities to Pursue Noble Goals and Engage Intrinsic Motivation, the two competencies where those in leadership have the biggest advantage. Second: In developing EQ strengths, “Ms. Average” should prioritize Navigating Emotions while capitalizing on stand-out strengths of Enhancing Emotional Literacy and Applying Consequential Thinking. Third: If it’s true that the skills of emotional intelligence are increasingly important in an increasingly complex marketplace, then males who want to compete will take heed. Males, especially in leadership roles, must increase self-awareness and reduce impulsivity. The bottom line is that as the value of emotional intelligence continues to be recognized, females have an important opportunity for creating added value and building workplaces where people thrive. As usual I am THRILLED with the studies, the experties, the dedication and keeping us on track! I’ve recently started to work with ‘Women in Male Dominated Insustries’ (mines and engineering companies) and find the statistics valuable. It gives me more confidence. I’m proud to refer to this network and want you to know, it empowers me to be of so much MORE power to the participants. Thank you and stay blessed and healthy. You are highly appreciated. Exciting to read the results of the study on leaderhsip and EQ. Provides direction for individual incresaed compentence and resulting enhanced results in reaching the goal of an organization or shifting the goal to better suit the expectations. Works to get one thinking about pursuing all sides of their abilities and achieve greater balance at work and in personal pursutis. Essentially offering a means of developing strategies and values giving deeper insight and probably more effective means with which to move with and through life. Thanks Donna — it’s an important point that when we work with strengths, we get much better results… so women and men should learn their strengths and play to those! Thank you, for Research link, sorry to analyse; but it really made me curious about the research.